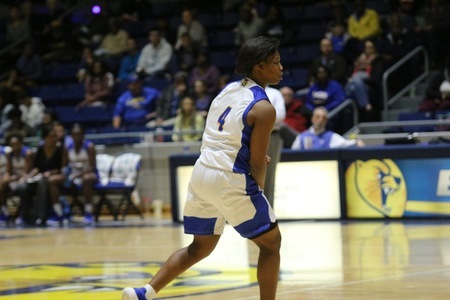 The Lander women’s basketball team built a 10-point halftime lead, but could not hold off a Wingate comeback in a 75-67 road loss on Tuesday night. 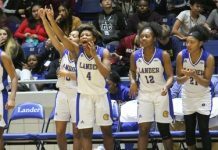 Lander (2-2) took its largest lead of the night on a Jessica Harris jumper as time expired in the first half, giving the Bearcats a 39-29 advantage. Lander forced Wingate (3-2) into nine turnovers in the second quarter and held the Bulldogs to just 4-of-14 shooting from the field in the period. Wingate stormed out of the gate in the third quarter with a 15-2 run to take a 44-41 lead with 4:47 left in the period. Symone Starks hit a three with 24 seconds left in the quarter to put the Bearcats back up by five as the Bearcats held a 56-53 lead entering the final 10 minutes of action. Once again, the Bulldogs took control to begin a quarter, scoring the first 10 points of the fourth before an Amiaya Melvins layup snapped the Wingate run. Lander could not pull closer than 10 points the rest of the way as the Bulldogs held on for the win. Four Bearcats finished in double-figures, led by Mylea McKenith’s 18 points and four assists. Jessica Harris finished with 16 points and four steals, while Melvins recorded 12 points, seven rebounds and four assists in her Lander debut. Starks netted 10 points and Tabitha Dailey grabbed seven boards. Lander scored 26 points off 22 Wingate turnovers and outscored the Bulldog bench 16-5, but the Bearcats were outrebounded 59-34 and surrendered 17 second chance points in the loss.